Will Steffen is a Climate Councillor. The Climate Council is an independent non-profit organisation funded by donations from the public. Its mission is to provide authoritative, expert advice to the Australian public on climate change. Martin Rice is the Research Manager of the Climate Council, an independent non-profit organisation funded by donations from the public. Its mission is to provide authoritative, expert advice to the Australian public on climate change. Macquarie University and Australian National University provide funding as members of The Conversation AU. Ninety per cent of Australia’s current coal reserves will need to be left in the ground for Australia to play its role in limiting warming to no more than 2C. That’s according to a report released today by the Climate Council, “Unburnable Carbon: why we need to leave fossil fuels in the ground”. The new report uses a “carbon budget” approach. This figures out how much carbon can be let into the atmosphere while limiting warming to 2C, and is a different method to the “targets and timetables” method favoured by international climate negotiations. These are are highly complex and difficult to interpret and put into practice. A carbon budget instead shows how much carbon humanity can spend without blowing the budget. And the more we dip into the carbon piggy bank, the more serious climate impacts become. Global temperatures have already risen by nearly 1C. Extreme weather events are set to become significantly worse in Australia. To track emissions against the warming limit of 2C above the pre-industrial level, the most commonly used method in the policy world is the “targets and timetables” approach. This is often based on a target reduction in greenhouse gas emissions by a certain date or over a specified period. Examples of targets and timetables include the United States target of reducing emissions by 26-28% by 2025 against a 2005 baseline and Australia’s target of reducing emissions unconditionally by 5% by 2020 against a 2000 baseline, and conditionally by 15-25% depending on international action. In practice, the complexity of the targets and timetables approach, especially the number of variations, makes it difficult to compare the level of effort of one country against another and to assess combined international efforts to stabilise the climate system. The carbon budget is a scientifically robust, conceptually simple way of estimating how much more CO2 we can emit to the atmosphere before we raise global temperature above 2C. It gives a single, globally aggregated amount of CO2 that can be emitted before the world’s economy must be decarbonised. Other greenhouse gases such as methane and nitrous oxide are accounted for in the construction of the budget. The higher the probability we want of preventing a global temperature rise of 2C, the more stringent the budget. For instance, if we want a 50% chance (the toss of a coin) of limiting warming to 2C, the budget from 2012 is 1112 billion tonnes of CO2. For a 66% chance, the budget is 1,010 billion tonnes of CO2. And for a 75% chance, the budget is 672 billion tonnes of CO2. If we want a greater than 75% probability of not exceeding the 2C warming limit, the carbon budget drops sharply to values much lower than 672 billion tonnes of CO2. To keep this challenge in perspective, current human emissions of CO2 are about 36 billion tonnes per year. At this rate, we would burn through the budget by 2032 if we want a 75% chance of meeting the warming limit. What does this mean for fossil fuels? From setting a carbon budget we can work backwards to figure out how much coal, oil and gas can be extracted and burned. An initial study in 2013 by the Carbon Tracker and Grantham Institute 2013 compared the known global fossil fuel reserves (coal, oil and gas) with the carbon budget. They estimated that if all of the world’s indicated reserves of fossil fuels were burned, 2,860 billion tonnes of CO2 would be emitted to the atmosphere. This is more than 2.5 times greater than the allowed budget for a toss-of-the-coin chance of succeeding. Recently, Christophe McGlade and Paul Ekins at University College London examined further the implications of the carbon budget for the use of fossil fuels. They used an economic optimisation method: how to gain the most economic value from the limited amount of coal, oil and gas that can be burned, and in what regions. This analysis, again based on just a 50:50 chance of preventing a 2C rise in global temperature, estimates that 88% of global coal reserves, 52% of gas reserves and 35% of oil reserves are unburnable and must be left in the ground. Put simply, tackling climate change requires that most of the world’s fossil fuels be left in the ground, unburned. 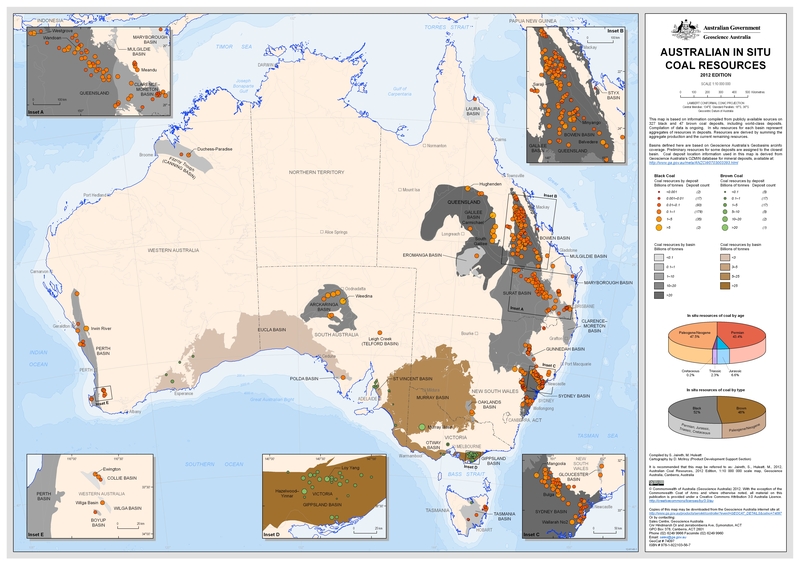 According to the study mentioned above, for Australia to play its role in preventing a 2C rise in temperature requires more than 90% of our coal reserves to be left in the ground unburned. Energy policies that continue to support substantial fossil fuel use are inconsistent with tackling climate change. A case in point is the proposed coal expansion in the Galilee Basin, which is not viable economically if the carbon budget is respected. The Galilee coal is lower quality and high cost to extract, meaning under a carbon budget limiting warming to 2C other reserves would be more viable, leaving other assets stranded like beached whales. But there is hope. Limiting global warming to no more than 2C – a goal Australia shares with 194 other countries – can open up opportunities for the Australian economy to prosper. For example, many of Australia’s coal-fired power plants are inefficient and nearing the end of their lifetimes, while concurrently the costs of renewable energy technologies such as rooftop solar and wind continue to fall. Work by ClimateWorks Australia and ANU shows Australia can decarbonise the economy with little or no cost through energy efficiency, low-carbon electricity (renewables, nuclear and carbon capture and storage), and electrification and fuel switching (from petrol to electricity or biofuel). With the carbon budget rapidly running out, it is urgent that global emissions begin to track downward in the next few years. Ultimately, most of the world’s fossil fuels must be left in the ground, unburned.